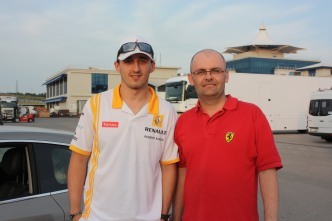 - the site of an F1 fan and autograph collector, who lives in Ireland. It's part of my life." I have been collecting Formula 1 autographs since 1994. Then I got my first 3 autographed cards from Ligier (Bernard, Blundell, Comas). Now, after 24 years, you can find here over 3100 most precious scanned autographs of Formula 1 drivers. The whole collection includes almost 3500 signed or unsigned cards, photos and postcards. I would like to take this opportunity to thank to all my friends, F1 teams, clubs, private persons and of course drivers for their help with increasing the collection. Many thanks to all the visitors from around the world, who looked at the website for the long years. If you have any comments, questions, found out any mistakes or you collect things like mentioned please do not hesitate to contact me. However, please note I DO NOT distribute drivers addresses and rather not looking for addresses. There are only 3 living drivers of approx. 860 participating in at least one GP weekend, whose autographs I don't have - Brausch Niemann (refuses to sign letters), John Barber (retired to live on a boat), Gunther Seifert (address unknown). Right now I'm concentrating mainly to collect official autograph cards and missing autographs of deceased F1 drivers. Design and PHP by Rafal Rokicki. Driver statistics by Forix. Here is just little FAQ for other fans to answer some questions before you send me an email. - WHY AM I STILL DOING THIS HAVING SOMETIMES DOZEN AUTOGRAPHS OF A DRIVER? : I still have a fun of collecting, I have fun waiting for autographs, like the atmosphere beside the fans and still have many autograph cards unsigned received from F1 Teams during past 20 years. It will be nice to have them autographed, won't it? - WHAT IS THE COST TO DO GP TRIP? : Well, it could be quite cheap especially sharing a car with other fans, having a general admission ticket, stay at the campsite and have car boot filled with food. For me living in Ireland I need to fly everywhere, usually buying 3-day GP ticket for approx. €200-350, so the total cost in Europe is about €600 staying in cheap hotel and up to €1000 for events like Singapore. - WHERE AND HOW TO COLLECT AUTOGRAPHS? : Many places like official autograph session, waiting beside paddock entry, waiting at the airport or stay beside hotels where the drivers are accommodated. Everyone has some tricks and favourite places. I'm not going to give you full guide, especially some places at the track are access restricted. What I try to do is to have respect for the drivers and usually I'm not annoying them when they are busy, talking over the phone etc. Sometimes it is really hard job to get autographs or wait for selfies. During Singapore GP it took me 12 hours to wait beside paddock (from 12pm to 12am on Thursday!). I'm usually traveling myself as I'm usually busy there at the track for all 4 days. I don't have intention to ruin somebody's plans and my plans. I use to get up early be at the track at 7-8am, stay there or somewhere until late evening hours. Sometimes it's just even easier to be at restricted place just for myself than for group of 3-4 people. Please also remember if it takes me so many hours to get autographs I'm doing this for myself. Don't have intention to send autographs for €5 or something, just because somebody wants it having nothing for trade. - WHERE WOULD I LIKE TO GO? : One day definitely Japanese GP. It is my dream to see Japan, Suzuka and feel the atmosphere over there.